All of our Products and Services are listed on this page, collectively. w/Dr. von Lähr,. Non-refundable advanced reservation. Available as In-person, By-phone, At-event. $6.00 per minute/$5.00 discount for this bulk package. Recording included FREE, and is not guaranteed. Could include psychism, clairvoyance, Mediumship, Soul Mate, Health Scan, Path, Career, Decisions, Detect negativity, Past lives, Pets, Aura cleaning, Chakra balance. $175. 30-min | buy now | save $5. See our Recommendations» from the Policy and Guidelines section. Best as HEALTH SCAN, or SOLE MATE draw. $265. 45-min | buy now | save $5. w/Dr. von Lähr, Non-refundable advanced reservation. Available as In-person, By-phone, At-event. $6.00 per minute/$10.00 discount for this bulk package. Recording included FREE, and is not guaranteed. Could include psychism, clairvoyance, Mediumship, Soul Mate, Health Scan, Path, Career, Decisions, Detect negativity, Past lives, Pets, Aura cleaning, Chakra balance. Best as COMBINED, or SOLUTIONS session. $350. 60-min | buy now | save $10. These are the 60-min programs discounted based on quantity of sessions over a period of twelve(12) successive months. Prepaid. Phone Only. w/Dr. von Lähr,. Non-refundable advanced reservation. Available as In-person, By-phone, At-event. $6.00 per minute/$20.00 discount for this bulk package. Recording included FREE, and is not guaranteed. Could include psychism, clairvoyance, Mediumship, Soul Mate, Health Scan, Path, Career, Decisions, Detect negativity, Past lives, Pets, Aura cleaning, Chakra balance. $700. 120-min | buy now | save $20. Christian connects with your Higher Self, and this is an actual [visual] process, something better suited to a true Master Clairvoyant. One must be able to see 65 million colors (every shade has a meaning), and beyond – where color gives way to vibration. Most people only function at the level of about 100 colors of general awareness. The difference in perception suggest here is literally in magnitudes. This should also suggest to you that Christian would be taking in the Higher inspired guidance through a great many channels at one time. This is literally marvelous. Genius in our physical world suggests someone who can maintain awareness at three channels of thought – the process defined herein is 14 at minimum to a more typical 256. 1024 channels at one time will sometimes be necessary in order to communicate at the Highest of planes. And so it goes that Dr. Christian von Lähr can also join with your actual “Seeding” Archangel, which is the absolute highest form we as humans can connect with. Christian has both the experiential communication we find in the 256 dimensions of Heavenly communication, but can also then go up further into the upper Planes of Consciousness. At this height, he will be functioning beyond all human form. This simply starts with the “one-ness” that others talk about – he is able to [understand] your existence over an expanse of 30 billion of our years – the past, now, and into the future. THIS is the perspective that allows him to understand the tiny context of life you find yourself in today – but as with a full-length movie, every frame, even the current one, adds continuity to the story, and is therefore, quintessential. THIS IS a quintessential Reading. THIS LIFE has meaning, a specific, quintessential purpose. Rate @ $400. per hour. MENTOR HOUR - Mentoring is typically offered in a large block of endeavor, which Dr. Christian Toren von Lähr styles as a “mentored transformation.” This is an exceptional, short-purpose session. Although having many similar aspects to the Life Reading, this session type is interactive, and takes advantage of that element to bring a person on-board with their destiny. This is a “transformation” session. For more information, see the Mentor Page. MENTOR 2 HOURS- Mentoring is offered in a large block of endeavor, which Dr. Christian von Lähr styles as a “mentored transformation.” Although having many similar aspects to the Life Reading, this session type is interactive, and takes advantage of that element to bring a person on-board with their destiny. This is a “transformation” session. AMAZON's copies ARE NOT new. NEW COPIES only available here. BOOK STORY - "If You Could Only See ... A Gnome's Story" | Christopher Valentine & Dr. Christian von Lahr| Hardback | Full color Dust Jacket | 229 total pages including some full color pictures. Extremely rare First Edition First Printing brand new copy. Collectors Item. (+) Want ALL FOUR instead? 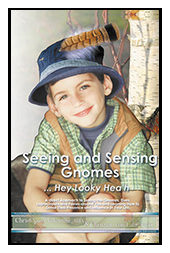 BOOK SEEING - "Seeing and Sensing Gnomes... Hey Looky Heah" First Edition - Brand NEW". Edges of Dust Jacket or book may be slightly worn due to warehouse to warehouse shipping over the years. 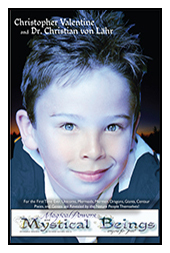 This is the only source for new books DIRECT from the Publisher. Author signed option at no additional charge. 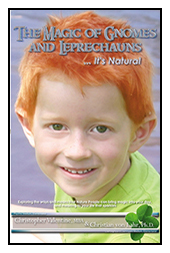 BOOK MAGIC- "the Magic of Gnomes and Leprechauns... It's Natural". First Edition - Brand NEW". Edges of Dust Jacket or book (may) be slightly worn due to warehouse. This is the only source for new books DIRECT from the Publisher. Author signed option at no additional charge. BOOK POWERS - "Magical Powers and Mystical Beings First Edition - Brand NEW". First Edition - Brand NEW". Edges of Dust Jacket or book (may) be slightly worn due to warehouse. This is the only source for new books DIRECT from the Publisher. Author signed option at no additional charge. BOOK PACKAGE - All 4 hard-copy books All Books are Brand New First Edition First Printing direct from the Publisher. Dust covers (may) have slight wear from-warehouses. SAVE an additional $50 on top of Bundled Savings and Shipping Savings included. 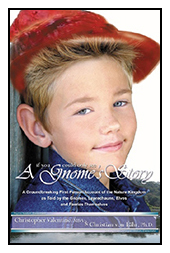 Gnomes" "The Magic of Gnomes and Leprechauns" and "Magical Powers and Mystical Beings" | Includes live lecture on CD. All Books are Brand New First Edition First Printing direct from the Publisher. Dust covers may have slight wear from multiple shipping from warehouses - but all books are new and unused. ADDICTION METAPHYSICS - Metaphysical Sessions do not require any subsequent conversation, participation or involvement from the Client. Only your agreement to let Christian work with your Higher Self for your betterment is required. (+) Add a Recurring treatment. BEHAVIORAL METAPHYSICS - Metaphysical Sessions do not require any subsequent conversation, participation or involvement from the Client. Only your agreement to let Christian work with your Higher Self for your betterment is required. CONFIDENCE METAPHYSICS - Metaphysical Sessions do not require any subsequent conversation, participation or involvement from the Client. Only your agreement to let Christian work with your Higher Self for your betterment is required. PSYCHIC DEFENSE METAPHYSICS - Metaphysical Sessions do not require any subsequent conversation, participation or involvement from the Client. Only your agreement to let Christian work with your Higher Self for your betterment is required. EMPOWERMENT METAPHYSICS - Metaphysical Sessions do not require any subsequent conversation, participation or involvement from the Client. Only your agreement to let Christian work with your Higher Self for your betterment is required. HEALING METAPHYSICS - Metaphysical Sessions do not require any subsequent conversation, participation or involvement from the Client. Only your agreement to let Christian work with your Higher Self for your betterment is required. HORMONAL BALANCING METAPHYSICS - Metaphysical Sessions do not require any subsequent conversation, participation or involvement from the Client. Only your agreement to let Christian work with your Higher Self for your betterment is required. JOB METAPHYSICS - Metaphysical Sessions do not require any subsequent conversation, participation or involvement from the Client. Only your agreement to let Christian work with your Higher Self for your betterment is required. LEARNING DISABILITY METAPHYSICS - Metaphysical Sessions do not require any subsequent conversation, participation or involvement from the Client. Only your agreement to let Christian work with your Higher Self for your betterment is required. MANIFESTATION METAPHYSICS - Metaphysical Sessions do not require any subsequent conversation, participation or involvement from the Client. Only your agreement to let Christian work with your Higher Self for your betterment is required. METAPHYSICS - Metaphysical Sessions do not require any subsequent conversation, participation or involvement from the Client. Only your agreement to let Christian work with your Higher Self for your betterment is required. PATH METAPHYSICS - Metaphysical Sessions do not require any subsequent conversation, participation or involvement from the Client. Only your agreement to let Christian work with your Higher Self for your betterment is required. MEDICAL PROCEDURE METAPHYSICS - Metaphysical Sessions do not require any subsequent conversation, participation or involvement from the Client. Only your agreement to let Christian work with your Higher Self for your betterment is required. See ourRecommendations» from the Policy and Guidelines section. PSYCHIC DEVELOPMENT METAPHYSICS - Metaphysical Sessions do not require any subsequent conversation, participation or involvement from the Client. Only your agreement to let Christian work with your Higher Self for your betterment is required. RELATIONSHIPS METAPHYSICS - Metaphysical Sessions do not require any subsequent conversation, participation or involvement from the Client. Only your agreement to let Christian work with your Higher Self for your betterment is required. SOULMATE METAPHYSICS - Metaphysical Sessions do not require any subsequent conversation, participation or involvement from the Client. Only your agreement to let Christian work with your Higher Self for your betterment is required. STRESS METAPHYSICS - Metaphysical Sessions do not require any subsequent conversation, participation or involvement from the Client. Only your agreement to let Christian work with your Higher Self for your betterment is required. TEST PREPARATION METAPHYSICS - Metaphysical Sessions do not require any subsequent conversation, participation or involvement from the Client. Only your agreement to let Christian work with your Higher Self for your betterment is required. WRITING METAPHYSICS - Metaphysical Sessions do not require any subsequent conversation, participation or involvement from the Client. Only your agreement to let Christian work with your Higher Self for your betterment is required.